SiteGround has been among the top best hosting companies for many years. They are a high reputable company providing hosting services and highlighted for their excellent support and easy-to-use features. It is one of the preferred companies for hosting Joomla and WordPress websites. 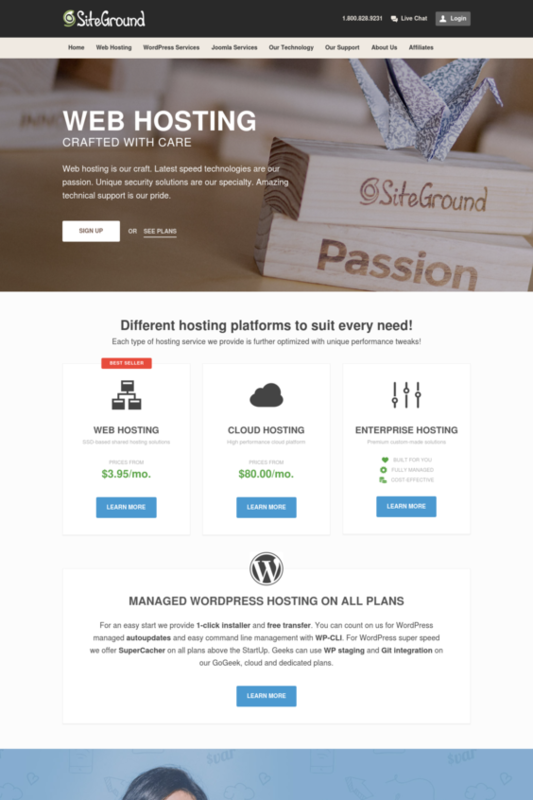 SiteGround is among the most popular hosting companies serving WordPress sites. SiteGround integrates with CloudFlare for improved performance and security online, CloudFlare helps to keep your site safe and troubleshoot DDoS attacks. Automatic backups are also enabled for your account. Customers can choose the server locations (which data center to use). The customer service is good, and they also offer a good uptime compared with other hosting services providers. Plans do not offer a lot of storage or unlimited bandwidth, like other services. SiteGround accepts major credit and debit cards. PayPal is also an option but it is not available as a default option, please contact customer support in order to pay with PayPal. Here you can get more information on payment methods accepted by SiteGround.